Diner food done well. They have been here since 1980, formerly a waffle house in the 70’s. 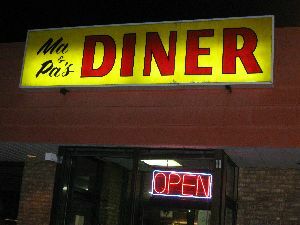 They are located next to a Aunt Shara’s Pancake House and a Waffle house. When we stopped about 8:30 PM they were the busiest of the three by far.The place needs a little TLC in the near future. We were with my sister and brother-in-law. The ladies had roast beef Don had meatloaf and I had a hot open face turkey sandwich, all come with a choice of two veggies. Great job, will be back when in the area!! *** I WAS BACK *** Yes! Debbie and I were traveling in the area and stopped for breakfast. Good food, with good portions. Service was fast and friendly.